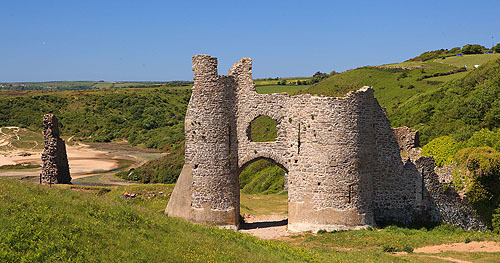 The Castle has a commanding position over the valley of Pennard Pill and fine views to Three Cliffs Bay. The present day ruins are the remains of a Stone Castle , built in the late 13th or early 14th Century . A small village with church grew up around the castle. Village, Church and Castle were all vulnerable to sand encroachment and all abandonment by the 1530's.